A couple of weeks ago my son studied Ancient Greece at school. He had multiple options for his final project and we decided to have a "Greek Cafe" as part of the experience. When I was a kid, I used to love to do restaurants to surprise my dad when he would come home from work, so I knew this would be really fun for all of us. 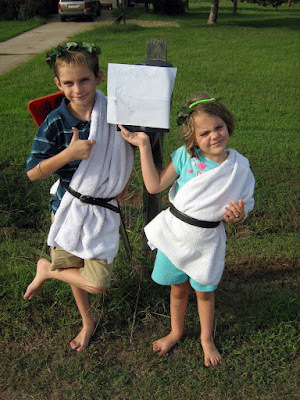 The kids dressed up and placed all the appropriate signs annoucing our cafe. The cutest part was how they thought that someone driving down our street might just be hungry and stop in to join us. 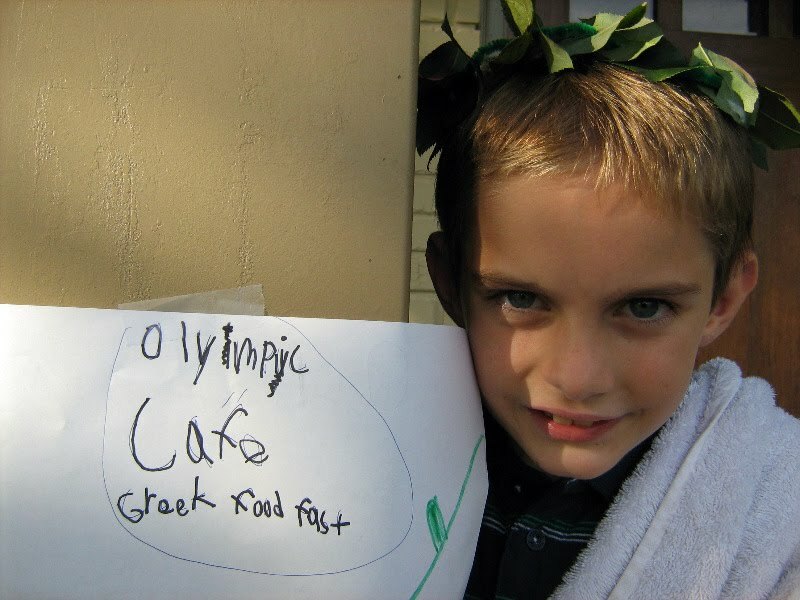 My son made the signs and came up with the name for our cafe. 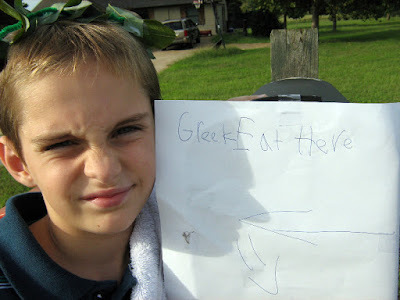 I asked for his input on the menu and spent the afternoon getting all the dishes ready for our Greek Night. We started with a drink called "The Greek Lantern". 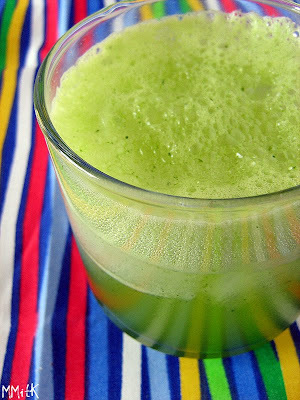 I have absolutely no idea if it is really a Greek drink, but it sounded really interesting, combining a large amount of fresh parsley leaves, lime juice, lime zest, club soda, water and ice. It actually was quite refreshing and surprisingly yummy. Next we had a Roasted Red Pepper with Feta dip and Lemony-Garlic Hummus with homemade pita chips. Both of these were really good, although the red pepper one was deemed "spicy" by my youngest child. Then we had mini spanakopita, which were really delicious and not as time consuming as I thought they would be. The soup was everybody's favorite. 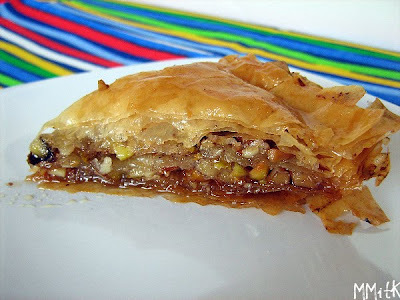 I have had it at Greek restaurants before and it was very simple to recreate at home. It is called Avgolemono Soup- which just means Egg, Lemon and Rice soup. You have to temper eggs to make it, but boy was it delicious. My kids loved it. I made a light version of Baklava that I found from Cooking Light. It was also much easier than I thought it was going to be to make. It turned out good, but was quite sweet, so could only be enjoyed in small portions. 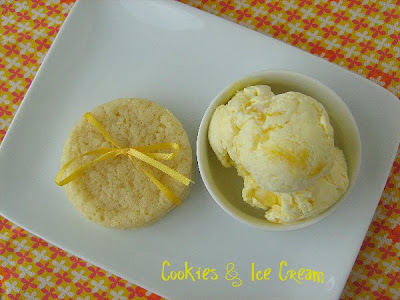 I actually had some leftover baklava mixed into this lemon ice cream a few days later and that was an amazing dessert. What Greek menu would be complete without some sort of Greek salad? I actually made 2 versions of this salad since we have two people in our house who don't like tomatoes. The second version I made with chopped red pepper to replace the tomato. These leftovers were delicious on a green salad and also in a pita sandwich. We had Chicken Souvlaki skewers, which my son loved. 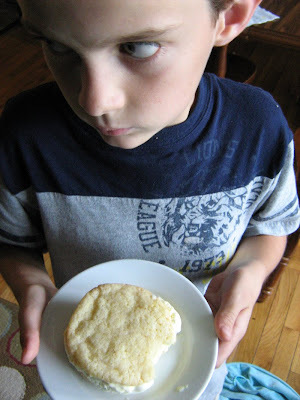 The Tzatziki sauce that went along with this was my youngest child's favorite thing. She was eating it plain and dipping all sorts of veggies in it. 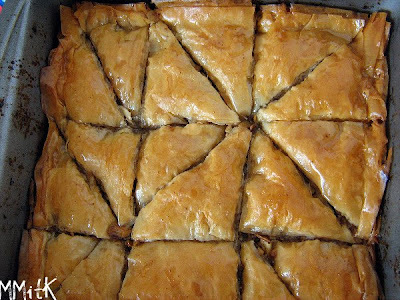 Here's a closer look at the Baklava. 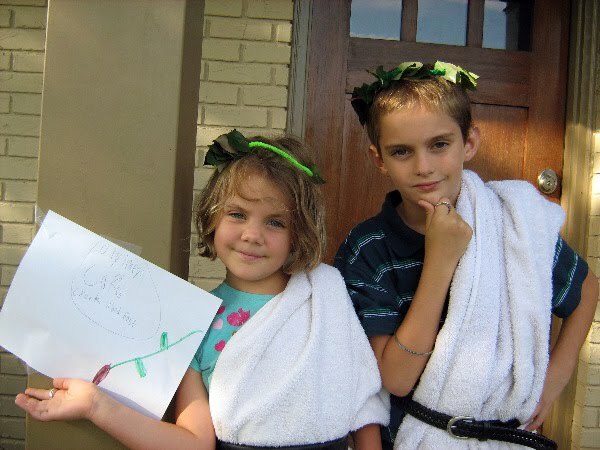 We had lots of fun on Greek Night! 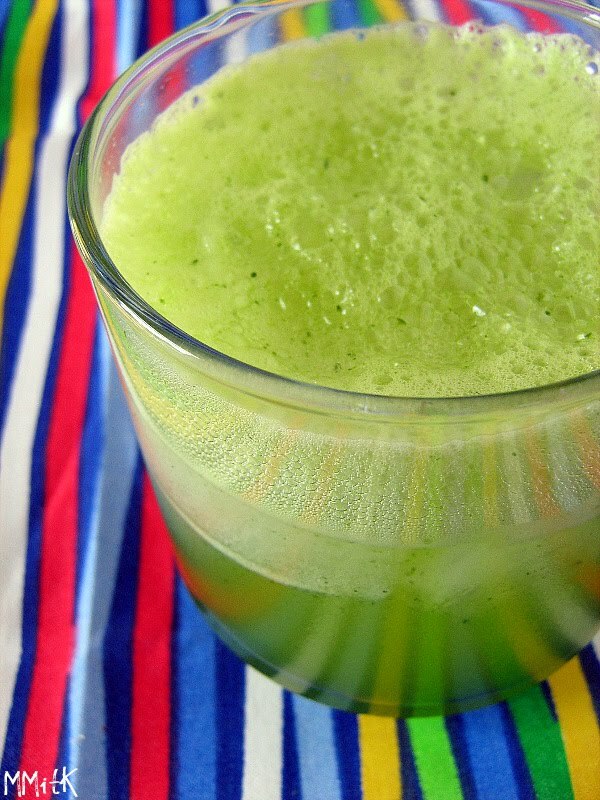 Blend all the ingredients, except club soda, in a blender, for about one minute. Take a large glass measure and strain the preparation through a fine-mesh sieve. Put ice into tall glasses and pour the prepared drink. 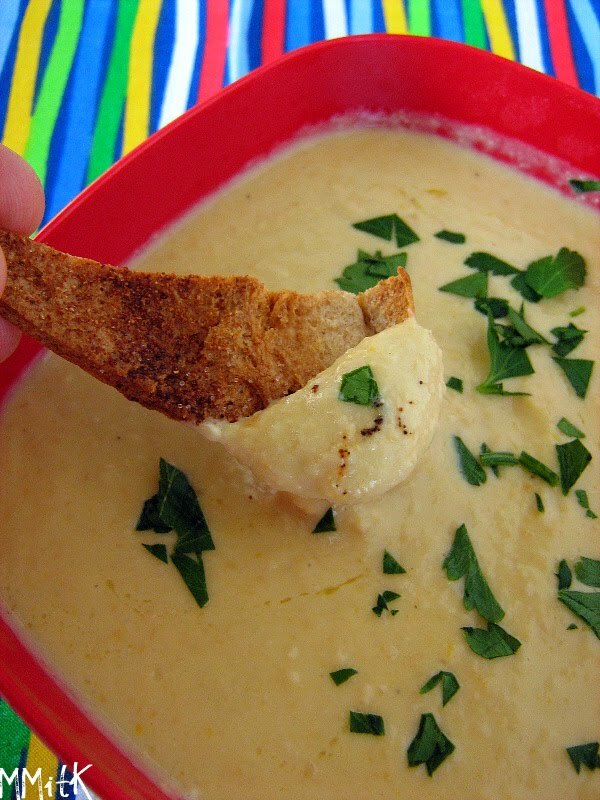 Combine first 6 ingredients into bowl of food processor. Blend for 2-3 minutes until smooth. Slowly stream in olive oil until combined and smooth. Taste for salt and add more if needed. 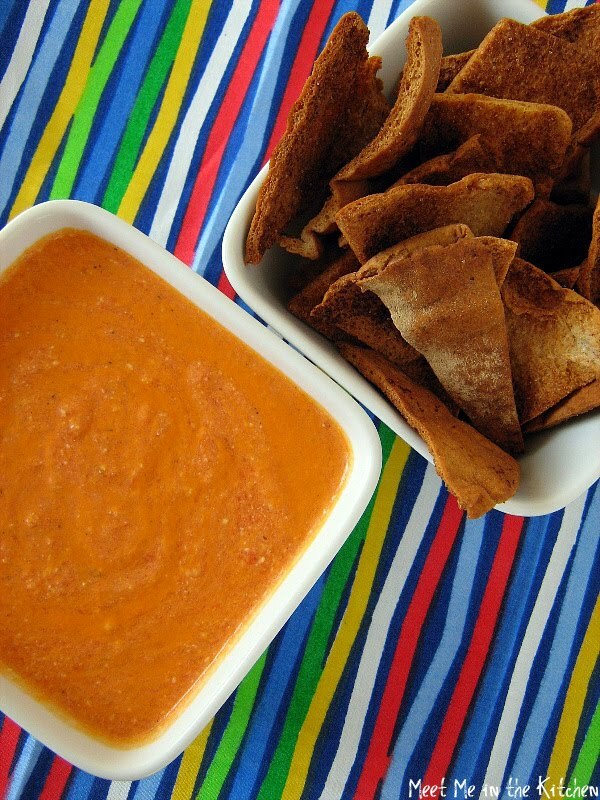 Serve with fresh cut veggies, crackers, chips, pita chips or crostini for a nice appetizer platter. Note: this recipe makes a large batch. Store in airtight container in refrigerator for up to a week. 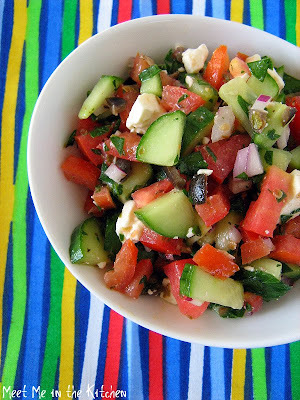 * I drastically reduced the amount of olive oil and feta cheese that this recipe called for. I just drizzled the mixture with a little olive oil and then used more lemon juice. I only added a couple of oz of feta cheese. * the egg white/olive oil mixture they said to brush the phyllo dough with, didn't work for me. I used cooking spray instead. I should've posted about these sooner because I can't remember why exactly we made them! 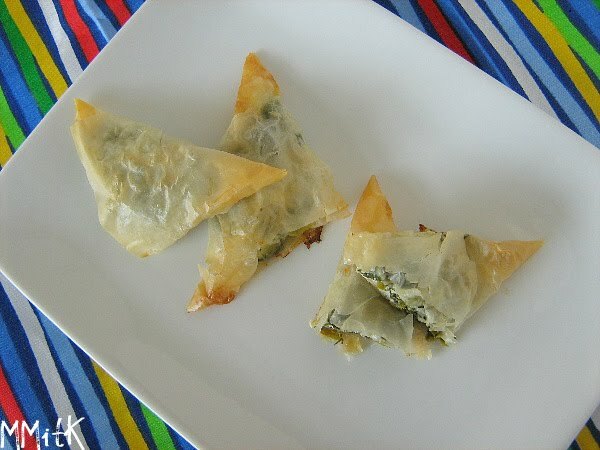 I do remember that they were delicious and fairly easy, so my family really enjoyed them. I always like it when you can make something at home that is usually considered unhealthy and it can be healthy and light. 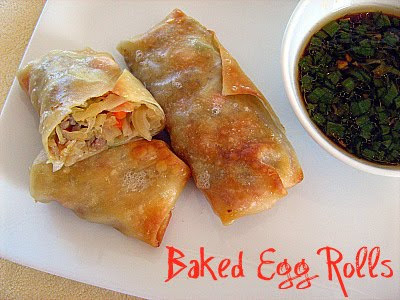 These have the wonderful crisp outside that you want from an egg roll and also a delicious filling. I preferred them without any dipping sauce. It seems like I always have either leftover egg whites or egg yolks that I need to do something with. The whites usually go in the freezer until I accumulate lots of them because then I can make angel food cake. I use the yolks within a few days and ice cream or pastry cream seem to be the easiest way to use them up. I had some leftover lemon curd that I had made for some mini cupcakes and since I really don't like to waste things like that, I was hoping I could incorporate it into whatever ice cream I decided to make. 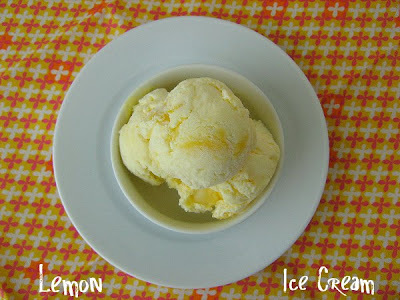 I also had tons of lemons, so lemon ice cream won out. This recipe makes a deliciously tart and bright lemon ice cream. The lemon juice, zest and sugar are combined first and chilled. Then the egg yolks are tempered with the hot milk. After both of those components are thoroughly chilled, they are combined with the cream. The technique makes for a very smooth finished product. 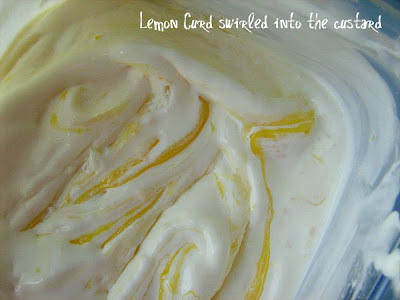 I swirled my leftover lemon curd into the ice cream base, after it was done churning. 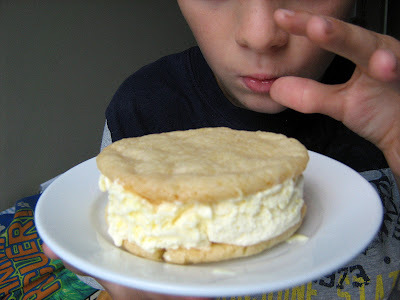 I thought this ice cream would be great for an ice cream sandwich so I searched until I found a chewy cookie that I thought would make a good base. 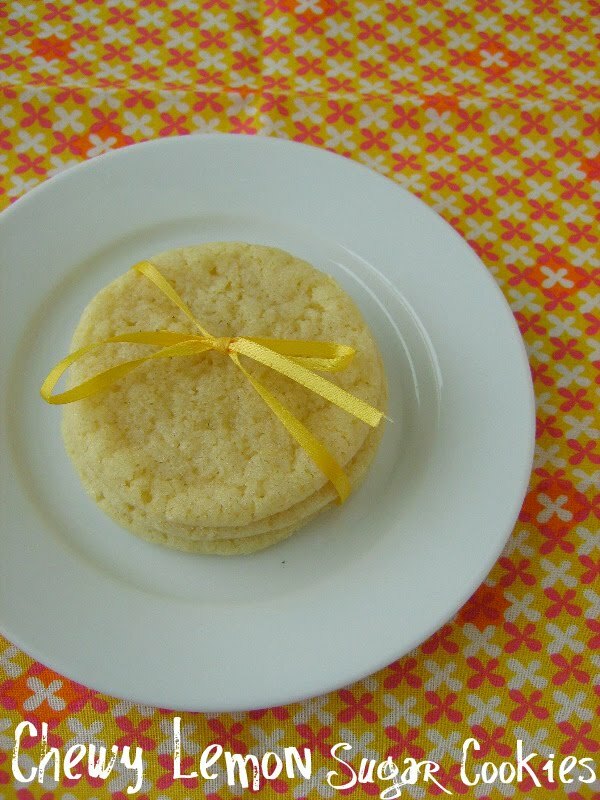 I found this recipe on My Baking Addiction and Jamie said herself that she liked the lime version of this cookie better than the lemon, but I was willing to take my chances. 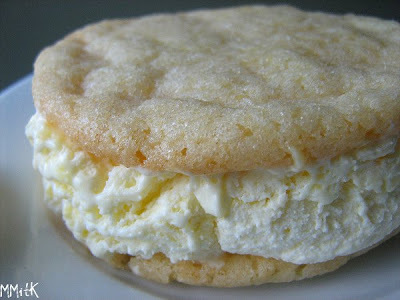 These cookies were perfect for the ice cream. My son could hardly wait for the pictures to be taken because he really wanted to eat this ice cream sandwich. 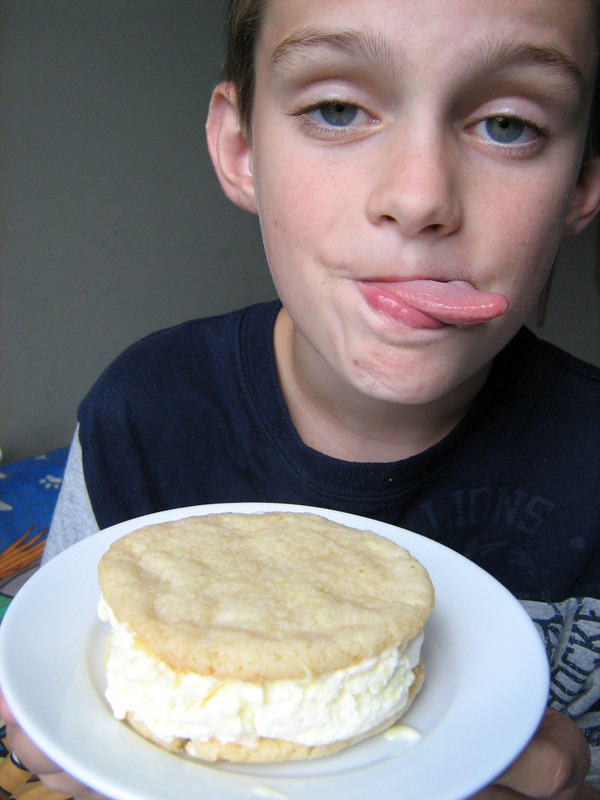 He begged me to take some photos of him "posing" with the dessert, so I did. He was not disappointed by this dessert in the least! In a non-reactive bowl, mix the lemon zest, juice and sugar (or agave nectar). Refrigerate one to two hours to blend flavors. 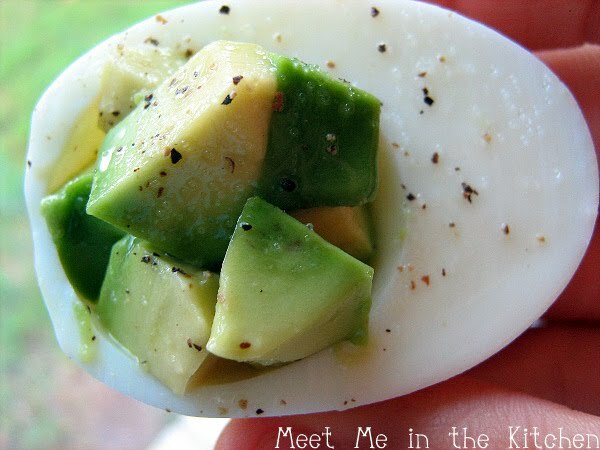 In a large bowl, slightly beat the egg yolks to break them up. Heat milk to barely boiling in a large heavy saucepan. Whisk 1/4 of the milk into the egg yolks to temper them and then whisk in the rest of the milk. 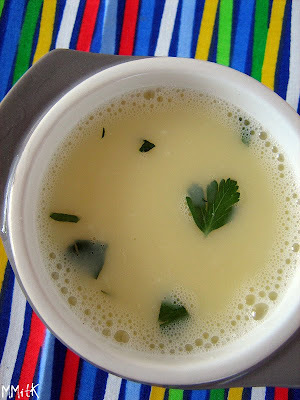 Return the combined mixture to the saucepan and gently heat (do not boil) until the mixture coats the back of a spoon. Combine milk mixture with heavy cream and lemon mixture. Churn in your ice cream maker according to the manufacturer's directions. 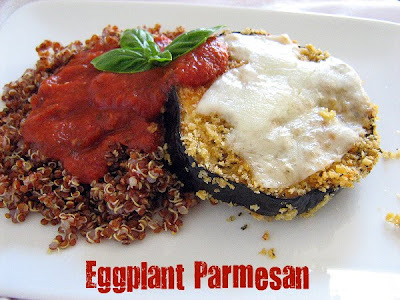 When I bought a couple of eggplants a few weeks ago, it wasn't because I had anything specific in mind that I wanted to make with them. It was because they were for a great price and I had no doubt at all that I would use them. I was flipping through Cooking Light and saw that one of the best recipes from that particular issue was for Eggplant Parmesan. I didn't follow the recipe completely, as they had it turned into a casserole of sorts-I just used their coating and baking instructions. 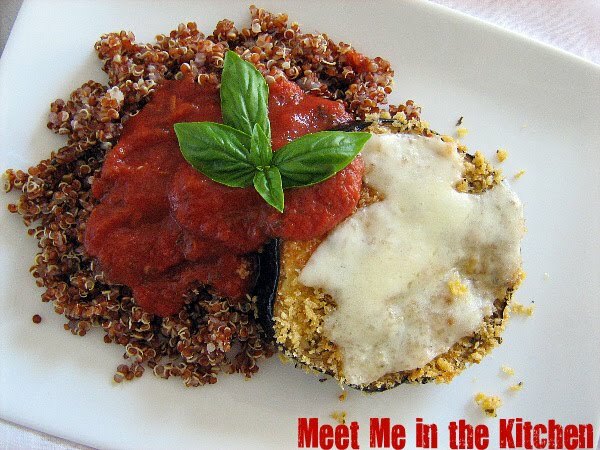 I decided to top our eggplant with provolone cheese, served it over red quinoa and used some bottled marinara sauce to bring it all together. My oldest son was a little bit wary of this dish, but I told him it would taste just like chicken. 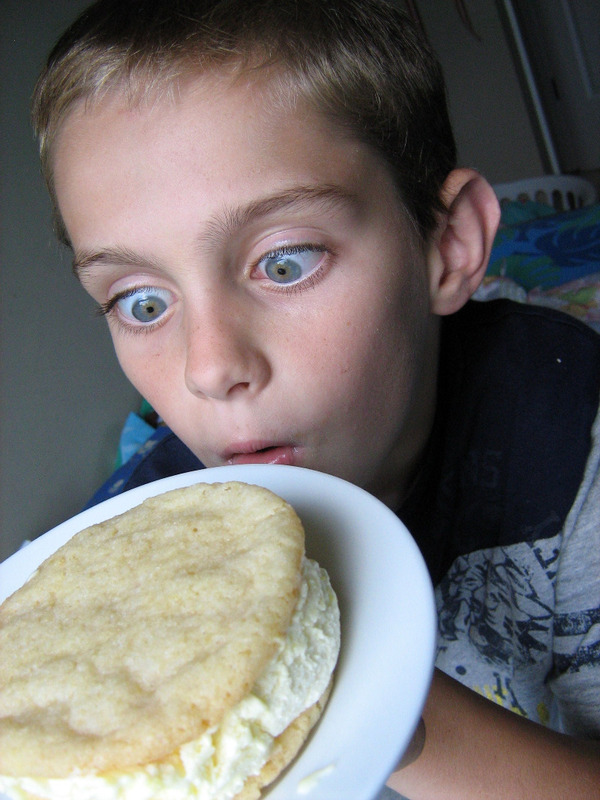 He tried it and concluded on his own that it did taste like chicken! 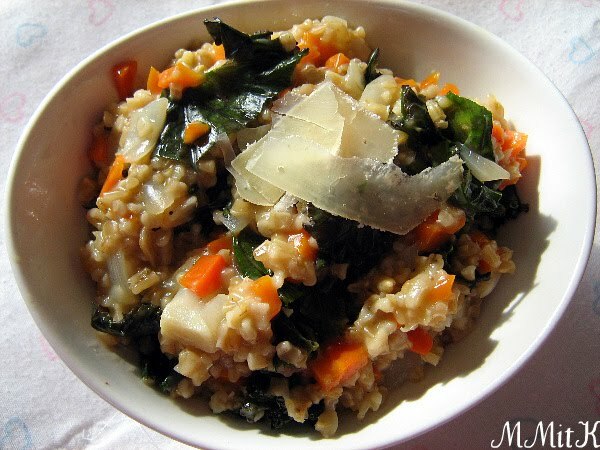 We really enjoyed this lightened version of a classic dish. It was good! 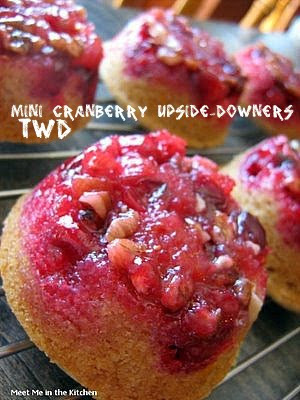 Last week's TWD pick, Cranberry Upside-Downer, was chosen by Sabrina over at Superfluous. She has the recipe posted HERE. You can also find the recipe on my blog when I posted about them almost 2 years ago. I love cranberries so I had to make this one before it was chosen for TWD. It is an absolutely gorgeous cake with the perfect amount of tart and sweet. I made mini's when I posted about this cake originally, but I have made it since full-sized too. You can check out what everyone else thought about this beautiful cake and see all the yummy variations by checking out the TWD blog! I made this recipe for Savory Oats and Kale a couple of months ago and I can't remember quite how I came upon the recipe but we absolutely loved it. 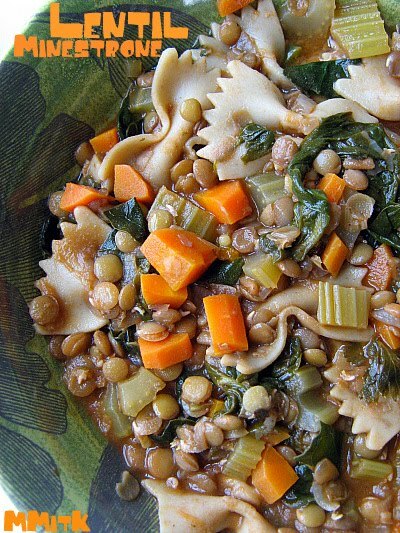 It has dark greens, which are always a hit- in this case kale and was just a really comforting dish. I also noticed just a couple days ago in a food magazine that there were a bunch of recipes that used oats in savory ways, so I think the idea must be catching on. Take a break from your usual morning oatmeal and try oats this way- it is a fun way to mix up your whole grains! and one day we decided we needed to make some cookies. I had seen this recipe online and wanted to try it, so I figured this was the perfect opportunity since there would be lots of kids around. I mixed up the dough and took it over to my mil's house. I baked the cookies while we were getting dinner ready and then we all enjoyed them before we watched a movie together. These were pretty popular all around. The combination of the oats and whole wheat flour give the cookie a nice texture that is slightly reminiscent of graham crackers. There is also a little bit of cinnamon which goes nicely with the other flavors. And who can resist toasted marshmallows? I don't know, but not very many people in my family can. I don't like meat. I don't like to cook it or eat it, so we rarely have it on our dinner table. Of course, if my kids want meatballs or chicken strips/tenders, I take the time to make them, but we usually eat vegetarian meals and lots of fish/seafood. Well, a couple of weeks ago I saw a recipe that I really wanted to try in Cooking Light Magazine. And it called for beef. It was weird for me because usually meat/chicken dishes do not appeal to me at all. Then, at the Farmer's Market, a nice farmer/professor had a booth about his grass-fed beef and so I went to talk to him. I asked him lots of questions, even specific ones about how his cows were processed. I took his business card. I thought about it for a couple of weeks. I decided that if we were going to only eat beef once a year, then it was perfectly okay to pay a higher price for it. My neighbor happened to buy some grass-fed beef from the same man and she said it was the best beef she had ever tasted. Now, I kinda did my own thing on putting this together. 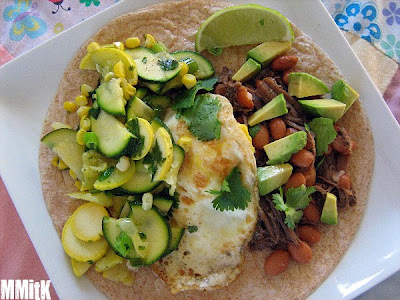 I cooked the beef according to the Beef Barbacoa recipe but made all sorts of changes when it came to the complete dish. I don't really remember what I did actually, so that is why the picture here and the picture featured over at Cooking Light look entirely different. The beef was good, but I still just don't care for it. My family on the other hand was really excited about the meat. This was just one of the recipes I tried from the newer version of Deborah Madison's wonderful cookbook- Vegetarian Cooking for Everyone. We absolutely loved it. I actually doubled it and froze some, so we could have a quick dinner. I end up doing that a lot when I make soups. I don't know what to call this, so if you can think of a better name for it, go ahead and call it whatever you want. All I know is that it was really delicious. I did something I have never done before in order to make this dish. I bought real bacon. I was at the Farmer's Market and a man talked me into buying these beautiful, fresh purple-eyed peas. But, since I am not a Southerner, I wasn't really sure what to do with them. 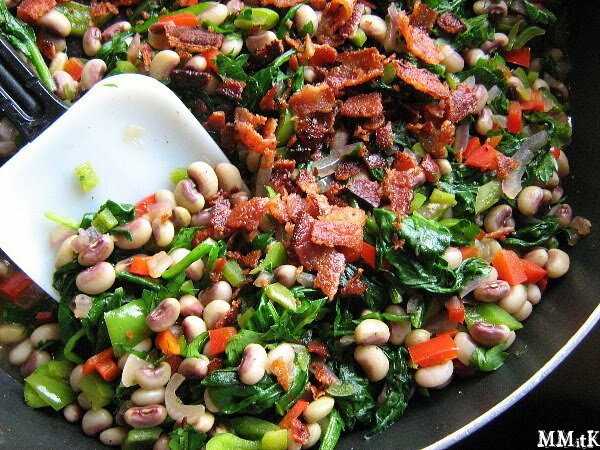 I had never had fresh any color-eyed peas. The man told me to cook them with a piece of fatback and I said "What? ", because I don't know what fatback is and I really don't want to know. I knew that wasn't happening. Someone else mentioned a ham hock, but once again, not familiar with that. I decided I would make my family happy and buy bacon. I know it can give great flavor to things, even though I prefer not to cook it or use it. I guess this was a special occasion. and fresh corn on the cob. If you have fresh purple-eyed peas, put them in a large pot with double the amount of water as peas. Bring to a boil. Reduce heat and cook for 30 minutes, mostly covered. In a large saute pan, cook 4 pieces of bacon over medium-high heat until nice and crispy. Remove the bacon to a plate covered with a paper towel and drain the bacon grease, but do not wipe out the pan. Add the red onion to the pan and saute for about 5 minutes. Add the garlic and saute for 1 minute. Add the red and green peppers and cook for about 3 minutes. Add chicken broth and season with salt and pepper. Stir in purple-eyed peas and remove from the heat. Crumble bacon and sprinkle on top. This week's Tuesday's with Dorie pick- Peanut Butter Crisscrosses, was chosen by Jasmine. You can find the recipe on her blog- Jasmine Cuisine. I made a half batch of these last week while my kids were getting ready for bed. They were really easy to throw together and there is no chilling time for the dough, so as soon as it is mixed up, they are ready to go on the cookie sheet. I reduced the amount of chopped peanuts and added in some mini chocolate chips, at the request of my kids. These were good. Just the right amount of chewiness in the center, yet a crunchy edge. I thought much better the next day as opposed to warm, but that is just my opinion. 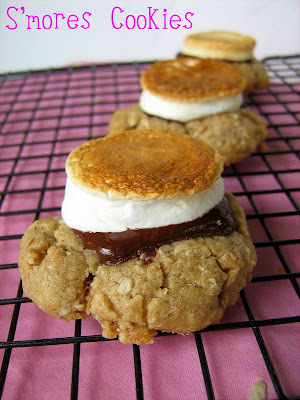 I got 30 cookies from a half batch of dough and will definitely make these again. Check out everyone else's results by heading over to TWD! They are essential to my life, mostly because I have small kids, but I enjoy snacks too. It can be hard to make sure that you are getting healthy snacks, especially since media and school and everything else is so saturated with unhealthy choices. I make sure that I have a fridge stocked with fruits and veggies, that can be easily accessed. I cut up tons of fresh veggies and put them on a platter (pictured below-jicama, carrots, cucumber, celery, red yellow orange & green bell pepper, avocado, cherry tomatoes) and let my kids eat away. Whatever is leftover, I put in a plastic bag in the fridge and then on other days of the week when they are begging for snacks, there are already veggies ready to go. I also make plates filled with cut strawberries/ other berries, kiwi, mandarin oranges, grapes or whatever other fruit I have on hand for my kids to snack on. When my kids beg for snacks, I tell them to choose a fruit, veggie or a protein (nuts, egg, beans) or a combination of those choices. Once or twice a week I bake a snack/treat, which is special. It could be cookies or something like that, but it is a special treat and my kids know they aren't going to be eating cookies every day of the week. I stay away from prepackaged snacks. Below I listed a few snack ideas that we eat on a regular basis. 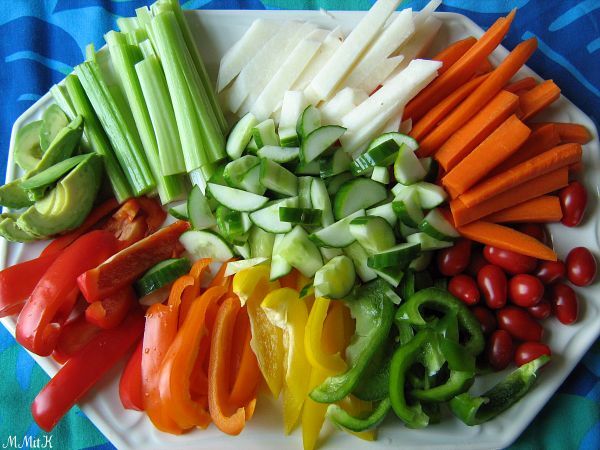 What are your favorite healthy snacks? At the end of last school year, my son was always begging me to buy granola bars. All the other kids got granola bars packed in their lunches, some even got chocolate covered granola bars filled with caramel, pb, and chocolate chips. Well, I am that mother who doesn't buy prepackaged things. 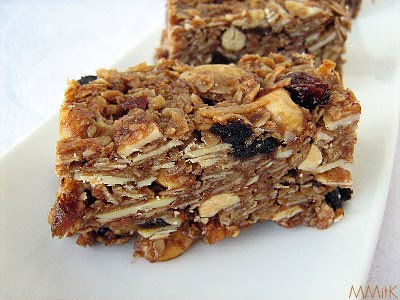 I decided that if he wanted granola bars, I would make them. sent them to me as part of Secret Baker. I knew they were really good, so I decided to use that recipe with the dried fruit and nuts that I happened to have on hand. These were perfect- chewy, sweet, crunchy and delicious. My son was happy and that made me happy. 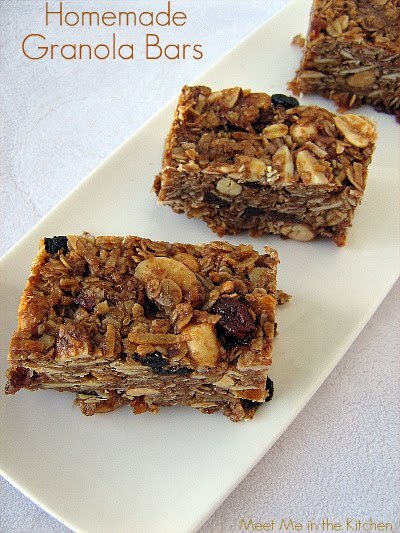 *I also added milk chocolate chips, but they melted into the hot granola mixture- (duh! ), so these kinda turned out to be chocolate coated granola bars!